My sister and I have a joke that it isn’t really a holiday until someone throws something. Once, a plate of Thanksgiving turkey was thrown at the end of a drama filled day and ended up a cracked mess of stuffing and cranberries all over the floor. Another year, a packed suitcase was tossed out our front door and wheeled down the street by its angry owner. The person with the suitcase hauled it all the way to the corner determined to walk to the airport, a 15 minute drive away. The truth is that in both examples, the throwers were not the only ones at fault. Everyone had their own place in the, “crazy making,” including me. This was the year of the flying mustard. The thrower was my husband. The brewing storm had been gathering and had I been more inclined to pay attention to it, I might have been able to halt it in its path. But maybe not. I had wanted to share some of the Christmas planning with Brian. I had tried to discuss a budget for presents, but he was never interested in doing it. I had sent emails about gifts he could himself gather and had hinted at gift cards (Lululemon?) for mommy. None of my attempts were successful. In the end I even shopped for his mother, because he didn’t seem to think it mattered to her. The reality is that he’s just not a gift giving kind of guy. He did come home a few days before Christmas with an iPhone for me, and I am grateful, but I did need a phone and he liked the idea that we could share grocery lists (I haven’t figured out how yet) so that we’d stop coming home with the same stuff from the store. His anxiety over picking something for someone else doesn’t allow him to experience the joy that is attained by the actual act of giving. As I attempted to get him to participate, his withdrawal became more obvious and my attempts at a partnership more futile. My partner in the planning was my mom. Peach and I had spent months gathering toys and treats for the kids and had wrapped and hid them in a closet in her house. Our goal was to ensure that the girls would have a wonder filled day. It was really all that mattered. The big event of getting the presents into the house wasn’t a big deal to Brian either, so the many conversations about how to get them in without any little people seeing was also unimportant. After many ideas had been tossed around, the final decision was made. He would pick up the gifts a Peachie’s house and hide them in the garage; the garage that we never park cars in. He thought they’d be fine in the driveway for a few hours until the girlies went to sleep, but my mother had been through the horror of having Christmas gifts stolen out of a car, and so didn’t feel comfortable with that. She mentioned that since his car was higher up than hers and had tinted windows, if he parked in the garage the presents would be safe from thieves and two pairs of prying eyes. Such an ordeal. It was almost too much for him. In the end he, did park in the garage, but managed to pull in too far and bust a hole through the drywall. As we sat at dinner, all seemed well with the world. It was way past S & G’s bedtime, so I began to collect them for bed. Daddy decided they should have dessert. He worked them all up for ice cream and they followed him into the garage for “ants in the grass” that he and his mother had bought that afternoon. They followed him in, and the next thing I knew, he was standing at the dining room table while their squealing little voices were left in close proximity to the gifts. I jumped up and ran out to get the children. My daughters had squeezed around the back of the Four Runner and were hopping up and down. Their mischievous smiles told the tale of what was to come. In my mind, and since I know my kids, their next step was going to be to try to open the car door. It’s a new skill that is worked on daily as we leave for school or the grocery store or wherever else the day might take us. I could see it start to happen. The excitement over Santa coming, the thrill of the big car being parked in the garage, the fun of jumping from front seat to back. What would I do if they saw the gifts? All our hard work would go up in smoke. Down in flames. I ushered the girls back into the house. My heart was beating so fast that my chest hurt and my face was hot. I was nervous and anxious and frustrated that he wouldn’t have been more careful. As we stood there in the kitchen arguing about the issue, Brian’s face turned red and he grabbed the mustard off of the counter. He hawked it with such speed that it hit the lower cabinet and it’s plastic top splintered off in another direction. He turned around and left. I quickly grabbed carrots from the fridge to be peeled and left for the reindeer. I plated the cookies, put the kids in the bath, and left Peach to wash their hair. Time sped like hitting fast forward on the DVR; adrenaline in motion. I was furious. I went back downstairs to find Brian and his mother mulling over the drama in the garage and I continued the fight. Here is where I should stop and mention that I spent the entire year of 2010 in therapy to learn how to manage these kinds of issues with my husband. The proper thing to do would have been to disengage. The right thing would have been to stay with the girls and bathe them myself. If only I could have been calm and collected and realize that nothing would be solved by going back to discuss the situation further. I should have known I’d make it worse. I wished I’d had the sense to realize that he wouldn’t think he was at any kind of fault. Would it have been so bad to let him think it was all my and mom’s fault? Would there have been any harm in letting him think he was totally in the right? Why couldn’t I use the skills that I’ve learned instead of resorting to the fighting response that is the result of old wounds? The wounds that have made me who I am and which need to be adjusted if I am going to stay married. I’m as mad at myself for continuing to fight as I am for the act of the mustard flying. In the end, my girls fully believed that Santa did come down our chimney, ate half a plate of cookies, and drank that big cup of milk. Rudolph nibbled carrots and quite possibly did so in our living room. There was no doubt that the presents under the tree were placed there after a long trip from the North pole, built by elves. The girls even got just what they asked for; a big giraffe for Grace and a big teddy for Soph. They believed. They were happy. Mission accomplished, right? Not really. Christmas should be filled with joy for all. It’s the season of giving, of love and of wonder. I’m sad my husband wasn’t filled with holiday cheer. I wish that he could have found some place in himself that made his desire to contribute to my holiday wish (for our kids) outweigh his own comfort level . I wished he’d let me put them to bed when I said it was time instead of offering them desert. I wish Peach hadn’t said anything, though I know why she did. I wished his mother had said more, though I know why she didn’t. I’m left with more questions than happy memories of this Christmas. Why didn’t I recognize what was happening and choose to be bigger? Why did I allow myself to be sucked into the fray? When will I re-act using what I know, and realize that I am only in control of me? As I write, the girls are playing with their toys. My husband and his mother have raced to the mall to gather shirts from Brooks Brothers. When they return, I’ll head out for my four miler. There’s a part of me that would rather crawl into bed until New Year’s, but instead I will run. I will run and run and run. I will look forward to the good things to come and will recommit to practice the lessons I have learned that will make me a better wife and mother. I will try to let go of the things that went wrong and focus on the things that are good. If nothing else, at least I have a new addition to the holiday throwing list. Let’s hope nothing else is ever added, ever ever again. Christmas is coming. There’s no time to write. There’s not even time to run. This morning is the children’s service at the Episcopal church downtown. I’m not sure there is anything better than a children’s choir. Sweet, high pitched voices pure and loud. I have to get dressed. I have to finish Peachie’s present. Must wrap the gifts that are still in hiding. Must dress the girls and wake up Oma and Daddy. Cookies need to be baked. The present pilgrimage from Peachie’s to a hiding place here must be accomplished. Grocery store list completed and shopped. Find time to Skype sissy. Eat and be merry. Nothing like leaving everything for the last minute. After a food and wine filled weekend in Virginia, I decided to get back to the plan yesterday. I had neglected an entire list of Mommyland chores the week prior, so yesterday was an exercise in diligence. I checked off each to do box, one after another, and felt a little more in control of my situation by the time the girls went to sleep last night. One of my goals for the day was to do some juicing. I am in desperate need of vegetables and nutrients in my diet, and since I lack the gene necessary for interesting and delicious cooking, juicing gets it done. 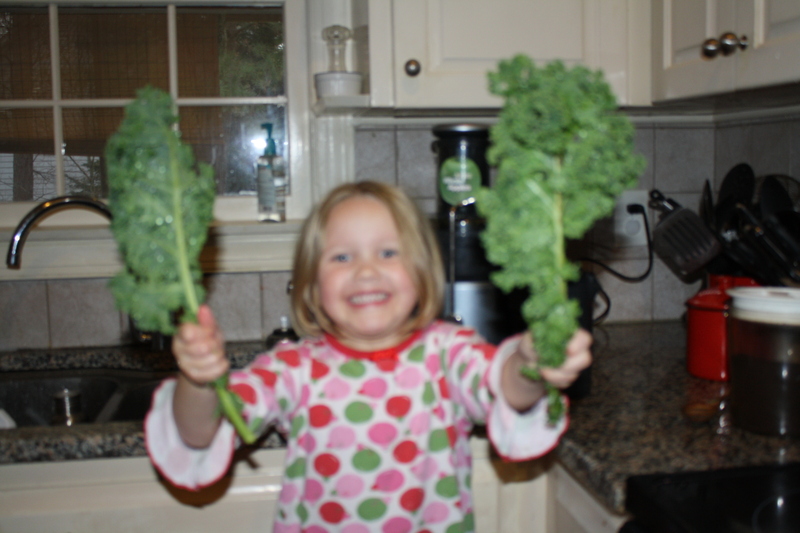 Plus, the girls like to help me, so I feel like they are getting a lesson in healthy living. Sorry about the fuzzy photos, something’s up with the camera. 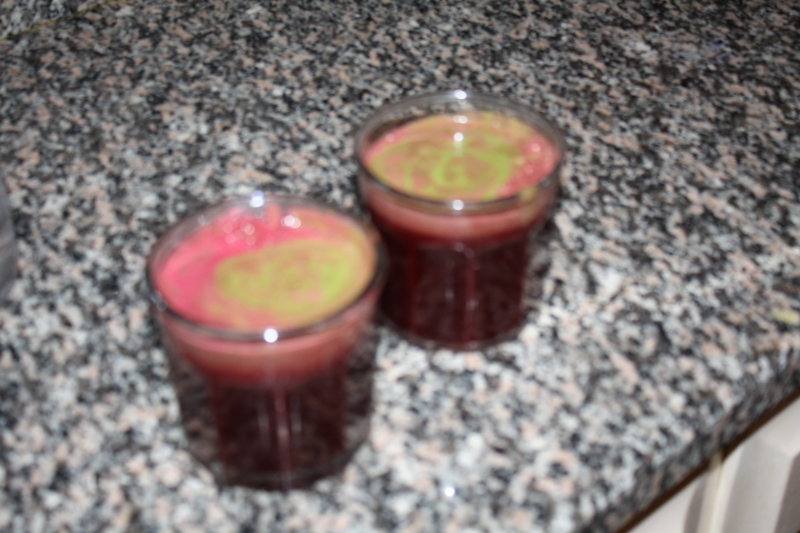 Cucumber, kale, celery, beets and apples. My race is now 16 weeks away. I went back to look over Hal Higdon’s plans and have decided that Novice 2 is where I should be. I am jumping in at week 3, which is fairly easy with the long run at only 6 miles. Yesterday I logged 3.5, and will attempt 5 today. It’s pouring rain right now, so maybe mom will watch the girls this afternoon so I can go. I’m dying to get to Jen’s vinyasa tomorrow while the kids are at school. I hate to play favorites (I really do love each and every Evolve teacher), but Jen’s class is the perfect mix of flow, intensity, and centeredness. I’m going to try my hardest to make it there. Yesterday’s to do list only has a few more boxes to be checked off; pay pre-school tuition, finish unpacking and fold the enormous pile of laundry. There will be a few moments of gratification when it’s done, and then I’ll probably sigh. Before that occurs, though, as inevitably happens, the next list has begun to write itself. The tree needs its ornaments, the presents I’ve already gathered need to be wrapped, and the baby jesus lights need to be untangled. December is on its way. You are currently browsing entries tagged with christmas at Running in Mommyland.